Anybody out there have a fear of flying ? You know that white knuckle feeling when you wake up in the middle of the night with a hostess lying across you and the sound of plastic cutlery showering around you as the “Please fasten your seatbelts” sign beeps loudly above the screams of the other passengers ? Well, I have the ultimate cure. Valium. Available on the NHS. Recommended doseage : 1 per 4 hours of flying. Got to Kuala Lumpur groggy but calm at 7 o’clock this morning. Had a bit of trouble remembering my name for the disembarkation card, but apart from that had a lovely flight. Even managed to blag my way into an emergency exit seat with extra leg room ! Now sitting in a lovely hotel in downtown Kota Kinabalu, air conditioning set nicely at 27.5 degrees, looking forward to a night out at the local Couchsurfers monthly get together at the Borneo 1945 Cafe. 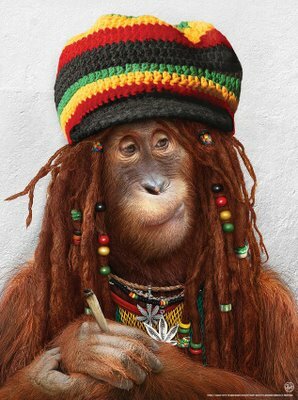 Hoping to meet some rasta orang-utans.